Local manufacturers are demanding an immediate review of the recently imposed National Social Responsibility Levy. 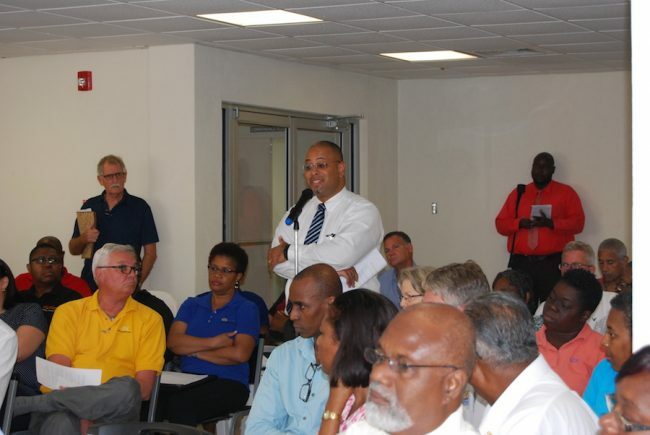 During a heated meeting at the headquarters Barbados Investment and Development Corporation on Harbour Road, officials of the Barbados Revenue Authority (BRA) were bombarded with questions and concerns from participants to whom they were unable to provide answers. This forced Minister of Industry, International Business, Commerce and Small Business, Donville Inniss to intervene in an effort to quell the situation, which at times became tense. Government minister Donville Inniss (right) was forced to step in Friday after officials of BRA could not prove the manufacturers with the answers they were looking for. At issue is the way in which the levy, which was announced by Minister of Finance Chris Sinckler in his August 16 Budget, is to be applied. Manufacturers, who are exempted from paying the two per cent on imported raw materials, are arguing that their refined products, which are to be used by other local manufacturers, should not attract the two per cent tax. For example, a local bakery purchasing the finished product of flour as a raw material is subject to the two per cent levy, despite the fact that the raw material used by the refinery did not attract the levy at the port of entry. The manufacturers argued that with this system, there would be no incentive for the local bakery to purchase flour from the local milling company since the imported product attracts less tax. This point was forcefully made by the CEO of Robert’s Manufacturing, Jason Sombrana, who beseeched the Government not adopt a heavy handed approach to entities not yet in full compliance with the tax, which took effect on September 1. Here, the CEO of Robert’s Manufacturing, Jason Sombrana, calls on Government not adopt a heavy handed approach to entities not yet in full compliance with the tax as other stakeholders, including businessman Ian Pickup (standing to his left), look on. He argued that the ambiguities of the levy had left many on an unsure footing. The CEO of River Bay Trading, Ian Pickup, also made his concerns known about the levy. In fact, he suggested that instead of introducing the contentious measure, Government should instead look at raising the Value Added Tax (VAT), which is currently applied on goods and services at a rate of 17.5 per cent to 19.5 per cent. Acknowledging the need for clarification on the matter, Inniss has promised to raise the matter with his ministerial colleague Sinckler. Friday, he also sought to assure manufacturers that the levy was not designed in any way to hurt local enterprises. “I certainly as Minister of Commerce will work very closely with the Minister of Finance to bring clarity from a policy perspective which would then be directed the BRA for onward dissemination to manufacturers,” said Inniss to an eruption of applause from the packed room. “Obviously the challenge lies now in implementing it and let’s be frank about that and listening to you here this morning, there is quite a bit of confusion and I am not going to deny that. He stressed that “the business community cannot exist in an atmosphere of uncertainty and this two per cent has obviously now created a level of uncertainty,” while noting that clear guidelines for implementation ought to be passed down from the Finance Minister to the BRA. He however urged manufacturers not to lose sight of the purpose of the levy, which is geared towards financing public health. The manufacturers present also pointed to the potential for increased energy cost in their daily operations, as even though services are not subject to the levy, the oil used in its production would be. This also would translate into a higher cost passed on to the consumer.